When did Frank Castle become the Ghost Rider? I either missed the memo or was washing what’s left of my hair when Frank met his grizzly end and thanks to a series of unscrupulous deals he made with some of the more nefarious characters in Marvelville, was brought back from the land of the dead to serve as the Black Right Hand of Thanos, the Herald of Galactus and the Ghost Rider. Frank’s been a busy boy*, and as Baby Thanos Must Die begins he’s finally been granted the rest that he so richly “deserves”, having been welcomed into the Halls of Valhalla by Odin**. 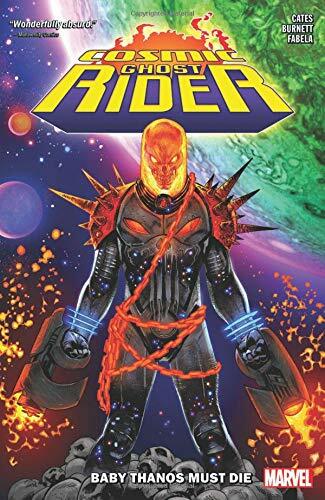 Thing is, Frank can’t help being Frank and before you can say “My, what an extensive weapon collection you have”, he’s upset the order of things and is thrown out on his black clad keister to once again become the Cosmic Ghost Rider. This might*** be old news and a rehash of what he did before for all of the fully clued up and switched on cats out there in fandom, but is sort of like hitting the reset button for me and, I’m sure, a legion of other Punisher fans. So, Frank now has the power Cosmic which is all kinds of cool because you know from the minute that he gets it, that he’s going to misuse and abuse it to do what he has to and whatever he thinks needs to be done and obsessed with making everything right, he uses it to alter the timeline and prevent as many of the bad things that happened to him from ever happening. In Frank’s broken mind this means going back in time to kill the individual responsible for all of his most recent woes (and those of countless others) before his target can unleash his evil on creation. The individual in question, is of course Thanos, but even Frank isn’t cold hearted enough to kill an infant in his crib, and thinking on the fly, decides to kidnap and raise Thanos far from murder, destruction and mayhem, which according to the gospel of Frank should be enough to stop Thanos becoming, well Thanos. However, the Punisher raising Thanos is quite possibly the craziest, and worst, idea that anyone in the Universe has ever had. But the only person who can’t see how insane it is, is Frank. Despite Fate, with a little help from Cable, hurling everything in its power at him to try and preserve the normal, far less dangerous and deadly, timeline, Frank is determined to follow his plan through right up until the moment that he’s confronted by the unshakeable truth of what he’s attempting to do, by the only person who can make him understand how flawed his logic is; Thanos. Which sets Frank, imbued with the power of the Cosmic Ghost Rider, and the Mad Titan on the sort of full throttle collision course that makes Hulk Hogan and Andre the Giant’s legendary Wrestlemania showdown look like the worst amateur backyard match in history. **And Odin did welcome The Punisher into the Hallowed Halls of Valhalla for no other reason than to irk and annoy his “wayward” son, Thor.